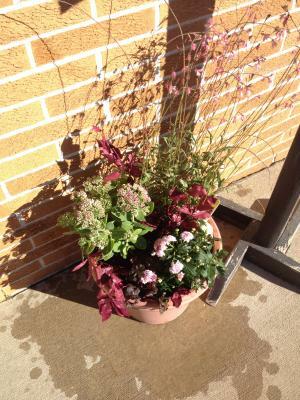 Many consumers have purchased patio pots or decorative containers of perennials. But just because these containers are filled with perennials, that doesn't necessarily ensure their winter survival. Without adequate protection from cold, a perennial plant can succumb to cold injury—turning it into an annual. One thing about over-wintering perennials in containers is that you can throw its USDA Hardiness ratings out the window. A plant's hardiness is determined by its ability to survive cold temperatures when planted in the ground. A containerized plant doesn't have the insulation provided by the soil and is much more sensitive to injury from cold temperatures. Go two Zones colder. Picking perennials that are rated two zones colder than your own will greatly reduce the amount of effort required to protect plants from cold temperatures. Use large containers. Large containers offer more cold protection to the roots than smaller pots can provide. Huddle for warmth. If you have multiple containers, group them together and place them in a protective corner. Also, they'll be more protected from cold if you put them on the ground rather than up on a deck. And avoid locations with prevailing winds. In some climates, it may also be beneficial to cover them with mulch to provide even more cold protection. Dig them in. Although they're in containers, why not dig a hole or a pit in the ground and take advantage of the heat and insulation the earth provides? Bring them in. Placing the containers inside a shed, or even better yet, a garage, is one of the best methods of providing protection from cold.